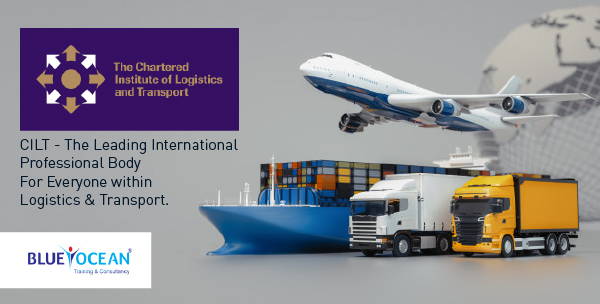 CILT – Chartered Institute of Logistics and Transport is a professional body representing the transport and logistics industries worldwide. It is a membership based organisation with over 30,000 members in over 30 countries. This international body is also known as CILT International. Blue Ocean, the region’s largest knowledge empowerment enterprise strikes an exclusive deal with the CILT – Chartered Institute of Logistics and Transport, London to offer top of the range transportation and logistics training to Middle East professionals, enhancing skills and encouraging them to embrace the “winds of change” sweeping through the region. The CILT International Award in Logistics and Transport has been designed to offer an entry-level overview and a basic insight into the logistics and transport industry. It also introduces students to different types of business communications, teaching them the skills to draw information from a variety of documents and equipping them for successful progression to other CILT International qualifications. career in procurement, warehousing and inventory control or production planning. It is ideal for managers with operational responsibilities and is also suitable for recent graduates entering the Logistics and Transport profession for the first time. The CILT(UK) Professional Diploma is aimed, typically, at candidates holding middle management positions in specialist functional areas such as Supply-Chain Management, Transport Operations, Transport Planning, Warehousing, Procurement, Production Planning and Inventory Management. management and to develop key skills in the area of leadership.